I love these croûtons as a compliment to a salad (consider adding them to Fattoush Salad or a Fall Salad with Roasted Garlic Vinaigrette in place of the croutons in that recipe) or as a simple, delicious, satisfying snack. 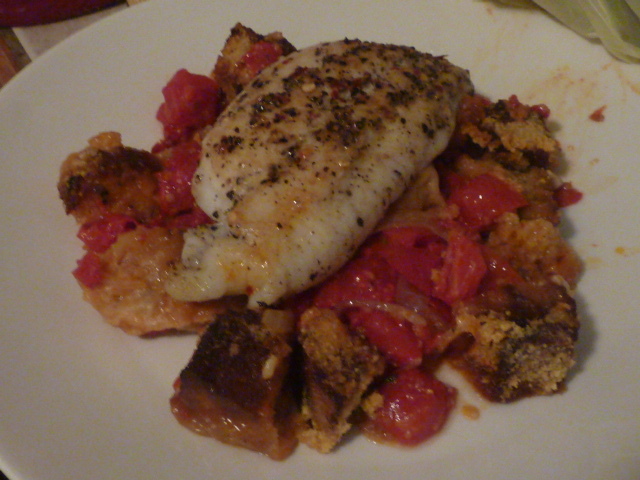 This a perfect way to use up some slightly stale bread. Oh, and, need breadcrumbs for something? Simply throw a few handfuls of these yummy croûtons into a food processor and pulse a few times. Voila! Cover a large flat baking sheet with tinfoil and spray with non-stick cooking spray. Spread bread cubes in single layer on the baking sheet. Spray with nonstick cooking spray and top with half of the sweet basil, parsley, and garlic powder (1 tbs. of each at this time). Season with kosher salt and freshly cracked black pepper to taste. Pour half of the butter over the bread cubes (1.5 tbs at this time). 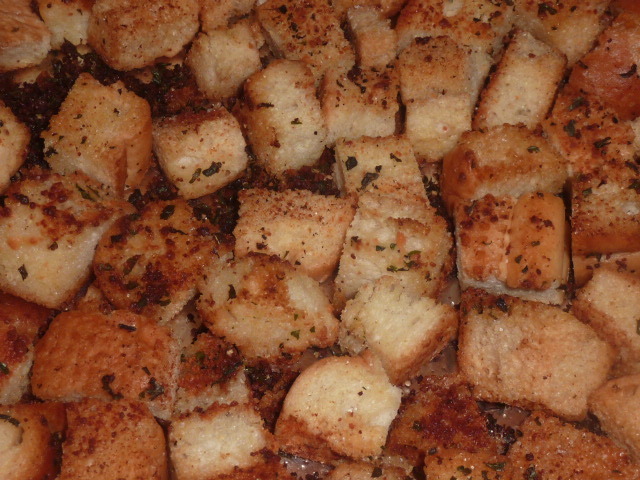 Sprinkle half of the grated Parmesan over the bread cubes. Very thoroughly shake around the bread cubes. Spray again with non-stick cooking spray. Add the remaining half of sweet basil, parsley, and garlic powder. Season again with kosher salt and freshly cracked black pepper to taste. Pour the remaining butter over the bread cubes. Sprinkle the remaining half of the grated Parmesan cheese over the bread cubes. Place baking sheet in the oven. Bake 10 minutes. Remove from oven and thoroughly shake around the bread cubes. Bake another ten minutes or until golden brown and crunchy. Enjoy! This salad was delicious and refreshing with the perfect inter-play of textures and flavors. The crunchy apples were deliciously sweet and tart, the salty, smokey flavors of the garlic vinaigrette paired well with the richness of the sunflower seeds and the homemade croûtons, and the spinach was perfectly soft with just enough of a peppery bite. Combine ingredients and toss well to combine. Place roasted garlic cloves, garlic salt, wine, Parmesan and a liberal amount of freshly cracked black pepper in food processor. Pulse 3-5 times. Add red wine vinegar. With food processor running, slowly pour in olive oil. Taste and re-season as necessary, adding red wine vinegar and/or olive oil as necessary for consistency. Cut bread into cubes. Season with garlic power and lemon juice. In a large sauté pan, heat olive oil over high heat. Add bread cubes and sauté roughly ten minutes, shaking pan and flipping bread cubes frequently until golden brown on all sides. Remove from heat and let cool. Do not cover them or place them in a zip lock immediately or they won’t stay crunchy. 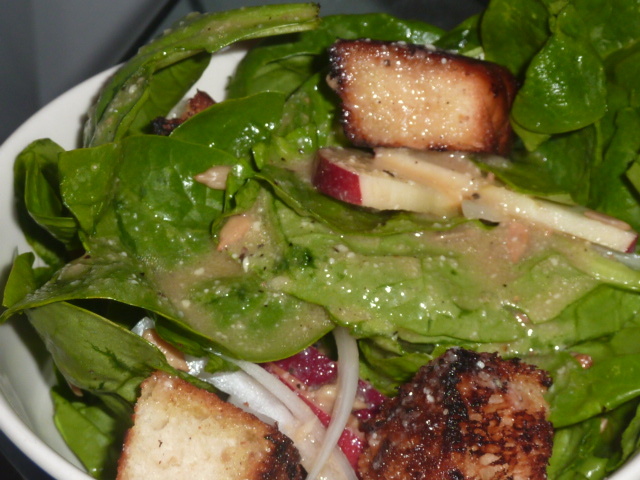 Top the salad with croûtons and roasted garlic vinaigrette. I had one huge, absolutely ginormous, amazingly beautiful beefsteak tomato my dad had given me a few days ago that was just on the latter end of perfectly ripe. I went out of town to South Bend this weekend with my dad to watch the Notre Dame-Stanford game, so I wanted to make use of such a delicious-looking tomato rather than let it go to waste. I was looking through my bookmarked recipes labelled “tomato” and found the wonderful Ina Garten recipe linked below and decided to give it a whirl. This dish turned out great. I wouldn’t waste my time with it unless you have farmer’s market or homegrown tomatoes, though – I have a feeling it wouldn’t be nearly as good with a sub par tomato. Coat a 5-6 cup baking dish with non-stick cooking spray. In a large sauté pan, heat 2-3 tbs. of olive oil over medium-high heat. Add cubed scallion bread and sauté 8-10 minutes, tossing frequently, until bread is deep golden brown on all sides. If necessary, add more olive oil 1 tbs. at a time. Remove croûtons from heat and place in the baking dish. Add the remainder of the olive oil to the sauté pan and turn heat to medium-low. Add garlic and onions and sauté until onions are translucent, roughly 5 minutes. Add the tomatoes, salt and sugar and sauté, stirring frequently, until heated through. Remove from heat and add basil leaves. Add tomato, garlic and onion mixture to the baking dish with croûtons. Mix thoroughly. Top with Parmesan cheese. Bake, uncovered, 30-40 minutes until cheese is golden brown and bubbly and tomato mix is heated through. Serve topped with catfish. Season fish liberally with black pepper, garlic powder, and crushed red pepper flakes on both sides and let rest until room temperature. In a medium sauté pan, heat olive oil and butter over medium heat until butter is melted. Add fish and sauté roughly 4 minutes per side until cooked through. Serve atop scalloped tomatoes. Combine all ingredients in a bread machine. Set the machine on the “Dough” cycle and allow to run. When cycle is almost complete, turn your oven to “warm” and spray a bread pan with non-stick cooking spray. Remove the dough from the bread machine and place in a bread pan. Turn oven off and set bread in oven for one hour and allow to rise. Remove bread from oven and heat oven to 350º. Bake the bread for 30 minutes. Remove from oven and let cool before removing from pan.